Here I will explain how to group columns in asp.net gridview header row in C# and VB.NET or show multiple columns under single column in asp.net gridview. In previous articles I explained Show Gridview row details in tooltip, Show tooltip for gridview header columns, jQuery change tooltip style in asp.net, Add tooltip to dropdownlist items in asp.net, Create simple tooltip with jQuery UI plugin, Asp.net Interview questions, Highlight Gridview records based on search and many articles relating to Gridview, SQL, jQuery,asp.net, C#,VB.NET. 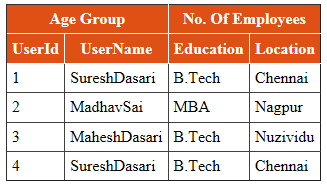 Now I will explain how to group columns in gridview in asp.net with C# and VB.NET. cell1.Text = "No. Of Employees"
Thanx. Easy and simple code. Thank you very much!! Simple and straight forward.